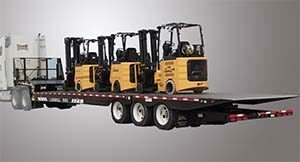 Midco Sales is a Landoll trailer dealer, promoting the full line of Landoll trailers at its dealership in Chandler, AZ. Landoll Corporation is based in Marysvale, KS. For more than 50 years Landoll has been the leader in producing quality equipment-transporting trailers for the agriculure, transportation, material handling, OEM and government industries. Landoll is the world’s leading manufacturer of specialized equipment transport trailers, producing high-quality trailers ranging from 5 to 60-ton capacity. 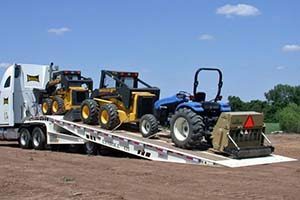 These ground loading Landoll trailers serve many industries including Towing and Recovery, Construction, Agriculture, Rental, Forklifts, and Storage Containers. 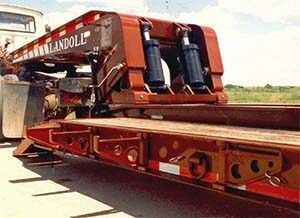 Landoll invented the traveling axle trailer in 1969. The term “traveling axle trailer” is commonly associated with Landoll. This trailer’s design produces the lowest load angles with capacities ranging from five to 55 tons. 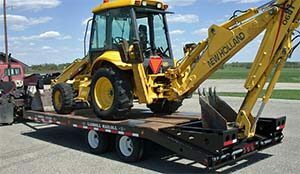 This ground-loading design is popular for towing and recovery, and heavy equipment hauling. The patented traveling undercarriage roller system and the tilt bed design makes Landoll the most-recognized name in this trailer category. The Landoll 440A is a tandem axle trailer with a capacity of up to 40 tons. It is available in 41′, 48′, 53′, and California legal 50′ lengths. Handle tough equipment including super low clearance pavers with an easy one-man operation. All 400 series trailers feature the super low clearance slope transition allowing man lifts, forklifts, and other difficult low clearance equipment to load easily on the upper deck. As a Landoll trailer dealer, Midco Sales stocks the Landoll 440A-50CA trailer. The Landoll 425C is a medium-duty, tandem axle, 25-ton capacity trailer available in lengths of 41′ and 45′. The 425C is ideal for narrow, tight, winding road and inner-city applications with a lighter hauling capacity. 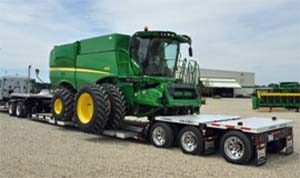 These 425C Landoll trailers may be a medium-duty trailer however, it still boasts all the features of the 400 series. The Landoll 455A Traveling Axle trailer will handle heavy loads with triple axles and 55-ton capacity. Lengths available are 48’, 50’, 53’ and California legal 50’. To maximize the load capacity, the 455 is standard with a 60” axle spread. Increased frame capacity is one of the outstanding features of the 455 along with wider main beams, wider undercarriage, wider tilt cylinder mounts and wider outer beam pivot points. 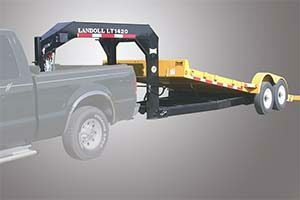 The Landoll 930D Traveling Tail trailer is capable of lifting 24,000 pounds up to 53 inch dock height. 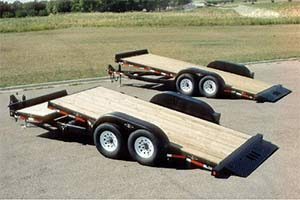 Maximize your loads by utilizing the entire deck and maximize your payload by having the undercarriage five feet behind the main hinge. The longer wheelbase gives you proper weight distribution between tractor and trailer and fully supports the tail. The traveling tail concept allows for stable dock loading and increases your payload by having a longer wheelbase. As a Landoll trailer dealer, Midco Sales stocks the Landoll 930 trailer. The Landoll 950D is 50-ton capacity and has three 25,000 pound axles. It offers tail lengths of 12 foot or 15 foot tails and 45 foot, 48 foot and 51 foot overall lengths. A 15 foot tail reduces the load angle to a low 11 degrees. Frames are steel shot blasted in preparation for the TGIC polyester powder coat paint finish standard on 900 Series Landoll trailers. The tail can raise and lift 24,000 lbs up to 57 inch dock height. Detachable Landoll trailers are are designed for today’s equipment dimensions which, in the agricultural and construction industry, include taller, wider and larger machinery. 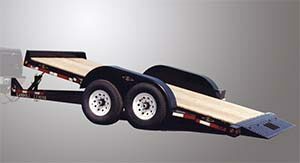 As a Landoll trailer dealer, Midco Sales can order any Landoll gooseneck trailer. The Landoll 325C detachable is a 50 Ton non-ground bearing detachable with a fifth wheel type automatic gooseneck lock engagement. The lock / unlock level can visually be seen from the tractor cab. A rugged low profile scraper style gooseneck with vertical lift cylinders has the ability to get you hooked up on the roughest of job sites or just out on the open road. This 50 Ton frame is rated in 10’. This concentrated rating is the shortest common rating out there. The Landoll 326C tandem axle 35 ton detachable can haul your loads safely and effectively. Manufactured with high tensile strength steel and high quality components, the 326C Landoll trailers will last the long haul while retaining its’ resale value. The Landoll 327C detachable trailer has triple axles with a 50-ton capacity and can haul loads safely and effectively. Manufactured with only high tensile strength steel and high-quality components, the Model 327C will last the long haul and retain its’ resale value. The Landoll 329C detachable trailer has triple axles and a heavy 60-ton capacity (120,000 lbs. 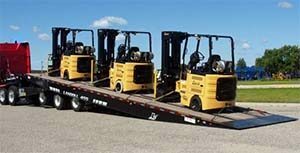 in 10 feet) and can haul loads safely and effectively. The 329C is equipped with a fifth Wheel Type Automatic Gooseneck Lock Engagement with Lock/Unlock Visual from Tractor Cab. The Landoll 825E-AG frame design features a flat deck with a loaded height of 17” off the ground. Coupled with a low tare weight, The 825 can haul the latest combines, tillage, haying equipment and planters with up to 32′ of usable deck space. The Landoll 835E-AG frame design features a flat deck with a loaded height of 18-1/4” off the ground. Coupled with a low tare weight, The 835 can haul the latest combines, tillage, haying equipment and planters with up to 32′ of usable deck space. A single hydraulic control lever lowers, detaches and activates the patented gooseneck carrier arms, which allows the ease and simplicity of detaching and loading directly onto the lower deck which is only 11¼” off the ground. You will never have to drive up and over the trunnion again. The Landoll 845E-AG Hauloll is designed to move today and tomorrow’s heaviest equipment. The 845E-HD-AG’s 45-ton capacity is matched to handle even the heaviest of the field-ready tractors and choppers in production today. 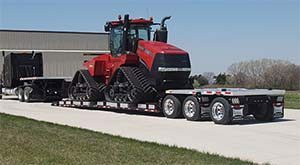 The 845E-HD-AG capacity comes in at 45 tons (90,000 lbs within 16’ and 80,000 lbs. 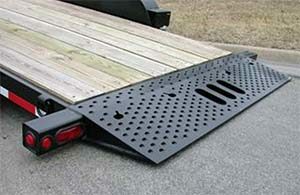 within 12’) and a 19-1/4” loaded deck height keeps the center of gravity lower than most detachable trailers. The Landoll 835E Construction is a 2-axle, 70,000 lb. capacity with a 12’ concentrated deck rating. The 835 two axle frame is third flip axle ready. The Landoll 835E-PS Paver is a 2-axle, 70,000 lb. capacity with a 12’ concentrated deck rating. The 835E two axle frame is third flip axle ready. The Landoll 855E-Construction is available as a 3-axle trailer or as a 3-axle with optional flip 4th-axle. The 855C has a concentrated load capacity of 110,000 lbs. within 12′. The Landoll 855E-HD Construction is a 3 axle trailer frame with hinge brackets air/electrical for a 4th -axle flip or a Nitrogen Stinger / Spreader Bar, 110,000 lb. capacity with a 12’ concentrated deck rating. The Landoll 855E-PS Paver is a triple axle, 110,000 lb. capacity with a 12’ concentrated deck rating. 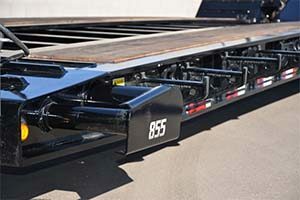 The 855 three axle frame is ready for the option of a fourth axle. 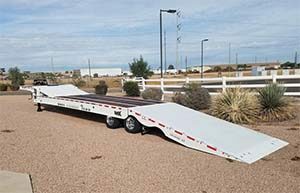 As a Landoll trailer dealer, Midco Sales can order any tag trailer. The Landoll LT1016A is a 10,000 lb. capacity 16′ tilting tag trailer designed to haul light construction and landscaping equipment. The LT1016A is ideal for rental applications. A cushion cylinder tilts the deck for easy loading and unloading. GVWR of the LT1016A is 13,150 lbs. The Landoll LT1016A+4 is a 10,000 lb. capacity, 20′ tilt trailer featuring a 16′ tilt deck plus a 4′ stationary deck for attachments, pallets, or supplies. A cushion cylinder tilts the deck for easy loading and unloading. The Landoll LT1020A is a 20′, 10,000 lb. 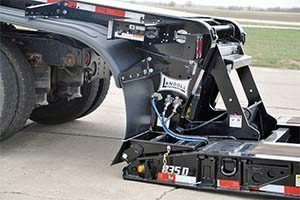 capacity tilt tag trailer featuring a tilt control system for loading multiple pieces of equipment. The tilt control system holds the deck in a tilted position during all loading operations. The Landoll LT1216+4 trailer is as 12,000 lb. capacity tilting tag trailer designed to haul light construction and landscaping equipment. The LT 1216+4 features a 16′ tilt deck plus a 4′ stationary deck for attachments, pallets, or supplies. The Landoll LT1220 is a 20′, 12,000 lb. capacity tilt tag trailer featuring a tilt control system for loading multiple pieces of equipment. 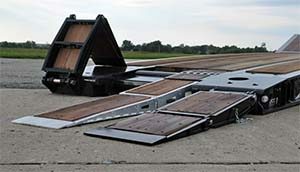 The tilt control system holds the deck in a tilted position during all loading operations. The LT1420 and LT1422 tag offers operators a full 14,000 lb. payload capacity. Now Available in Two Lengths -20′ or 22′. The Landoll L2024 is a 20,000 lb. 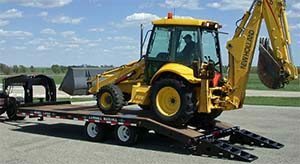 capacity (26,000 GVWR) trailer for hauling of backhoes, skid steers, rollers, and other construction equipment. The Landoll L2424 is a 2 axle 24,000 lb. 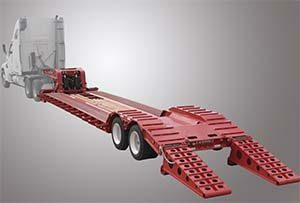 capacity tag trailer designed to haul a variety of construction equipment. The L2224 offers a 19′ flat deck and a 5′ beavertail. The Landoll L5029 is a triple axle 25-ton industrial tag trailer. The trailer features a 24′ flat deck and 5′ beavertail and powder coat paint.